There was a time when there were no malls, no multiplexes and no entertainment hubs; there were even no TVs, mobile phones or video games. Way back in the 3rd Century, the only source of entertainment was Shadow Puppetry. Shadow Puppets were made and played by great artists, with immense effort. Today, very few people practise this Art. With an aim to revive this age-old Art form, Sanskriti Foundation has brought together more than 70 representatives to showcase traditional Shadow Puppetry, at Anandgram. The Show has been organised on the occasion of its 35th anniversary. Shadow Puppetry comes from the states of Andhra Pradesh, Karnataka and Kerala. While leather puppets, known as Tholu Bommalata are popular in Andhra Pradesh, Karnataka is famous for its Togalu Gombeyatta – which are very small in size. “The puppets differ in size according to their social status; for instance, a large size is for kings and religious characters and smaller sizes are for common people or servants,” informs a puppeteer, who has travelled from Hyderabad. Interestingly, use is also made of coloured shadows on a screen. The Puppets are pressed against the screen, and are ‘lit’ from behind by a strong source of light. The manipulation of the light and the screen outlines the shape, and the light is used to provide colour. The stories that are being portrayed at the Show are generally from the epics of Ramayana and Mahabharata. While religious folk would appreciate the portrayal of the divine epics, the others would find the experience entertaining – even humorous. 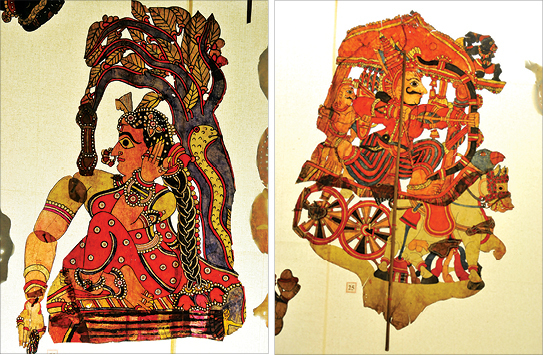 For children, Shadow Puppetry is a fun way to learn about the popular Indian epics’ characters and tales. For visitors, the Show is undoubtedly a visual treat. “I think both the content and the presentation have been beautifully wrapped. It is so unique and entertaining that language is never a hurdle,’’ says Kiran, who has attended the Show with her two children. Though Shadow Puppetry is a cultural heritage of India, Puppet makers are today surviving on selling Puppets as wall hangings to emporiums and export houses, while Puppeteers have no source of employment. “In Hyderabad, Shadow Puppets are used in schools to spread awareness about various social issues. Using a dying Art to spread the word is an innovative idea. It also provides much-needed employment to the poor Puppeteers. I think this process can be replicated in Gurgaon, as we have many Puppeteers residing in nearby villages,” feels Harish, a visitor. Apart from Shadow Puppetry, the Sanskriti Foundation is also presenting Exhibitions of Jain Temple hangings and Indian Terracotta. While the Jain collection captures the Embroidery Art performed by Gujarati Jains in the early 20th century, the Terracotta Exhibition showcases Manasa Jhar and long-necked Terracottas from Bankura, West Bengal - and rare votive figures from South Gujarat. Interestingly, ‘Indonesian Ikatsand’ embroidered textiles, from the Thar Desert area, are also on display.